●I am reminded how commonly markets fail to behave the way you expect. 당신이 예상한 대로 움직이는 경우가 드문 곳 - 그것이 시장이다. ●The only way to navigate the twin hazards of complacency and panic was by choosing my words very, very carefully, softening concerns and using calculated ambiguity. 자기만족과 공포. 이 두 가지 감정은 늘 함께 따라다녔다. 마치 쌍생아와 같다고 할까. 말을 좀 더 신중히 하고, 의도적으로 근심을 누그러뜨리며, 계산된 모호함을 유지하는 일이 나의 과업이었다. ●The first lesson is that our ability to address economic crisis beyond our borders is limited. 첫 번째 교훈은 명확했다. 국경 밖에서 전개되는 경제위기에 대응하는 우리의 역량에 한계가 있다는 것이었다. ●In 1995, I referred to the Mexican crisis as a very low-probability event. 지난 1995년을 다시 떠올려 보자. 나는 멕시코가 위기를 겪을 가능성이 적다고 봤다. ●Stocks outperformed bonds for every decade of the twentieth centry, except for the 1930s. 주식은 20세기 들어 채권의 수익률을 늘 앞섰다. 예외라고 한다면 1930년대 뿐이었다. ●Investors should recognize the risks they are taking. 투자자들은 자신이 떠안고 있는 리스크를 인식해야만 한다. ●The most obvious change was the growth of international trade with developing countries. 가장 뚜렷한 변화는 (미국이) 개도국과 더 많은 무역을 하게 됐다는 점이다. 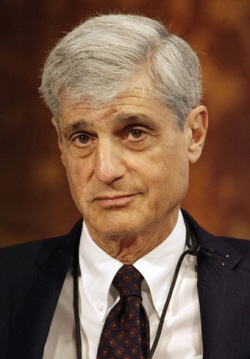 ■로버트 루빈(Robert E. Rubin) 로버트 루빈 씨티그룹 고문은 투자은행 골드만삭스 출신으로 클린턴 행정부에서 재무장관을 지낸 거물급 기업인이다. 클린턴 행정부 재직 시절 멕시코 금융위기, 러시아 채무 불이행, 그리고 아시아 국가들의 외환위기 사태를 경험한 노련한 금융전문가인 그는 헨리 폴슨 현 재무장관을 상대로 금융위기 타개책과 관련한 조언을 아끼지 않고 있는 것으로 알려졌다.